After sleeping on the decision, Rick decides that Randall must be executed. Learning that Randall belongs to a violent gang of survivors only reinforces his decision. 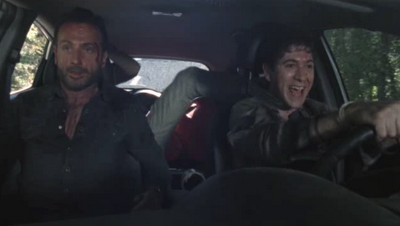 Dale is horrified that the Group seems satisfied with the plan to kill a man. 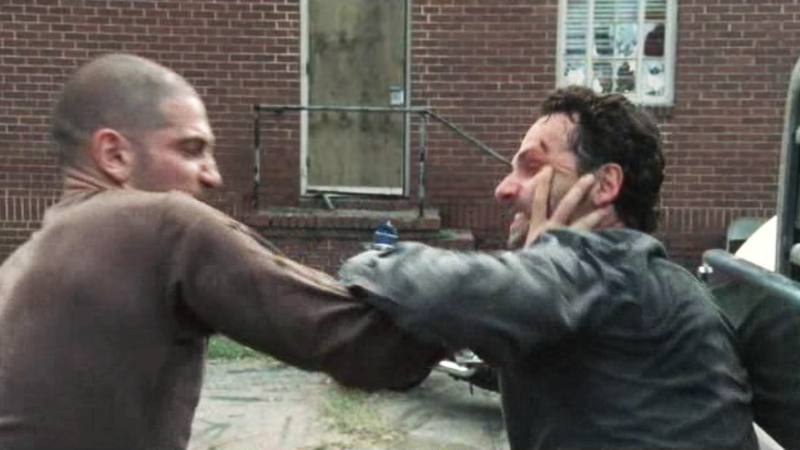 He convinces Rick to give him one day to reason with the rest of the Group to spare Randall's life. Andrea agrees to guard the young man until Dale can plead his case. 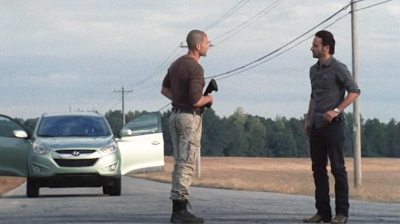 Dale approaches Daryl Dixon first to discuss the execution. 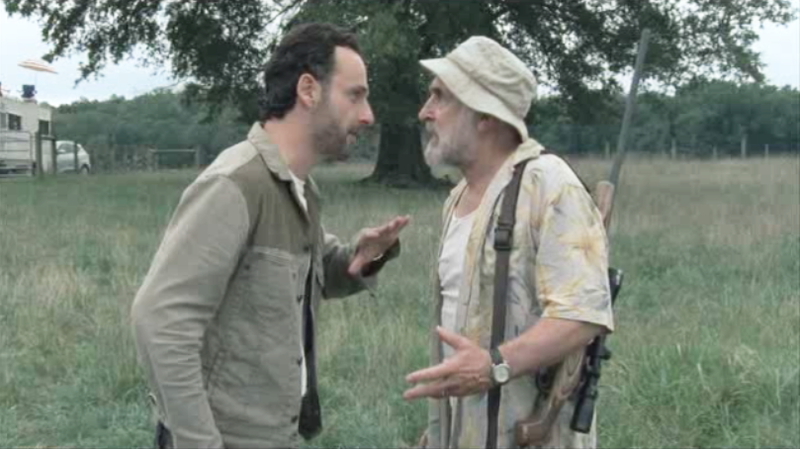 Dale tries to reinforce to Daryl that he is a decent man and his opinion matters to Rick. 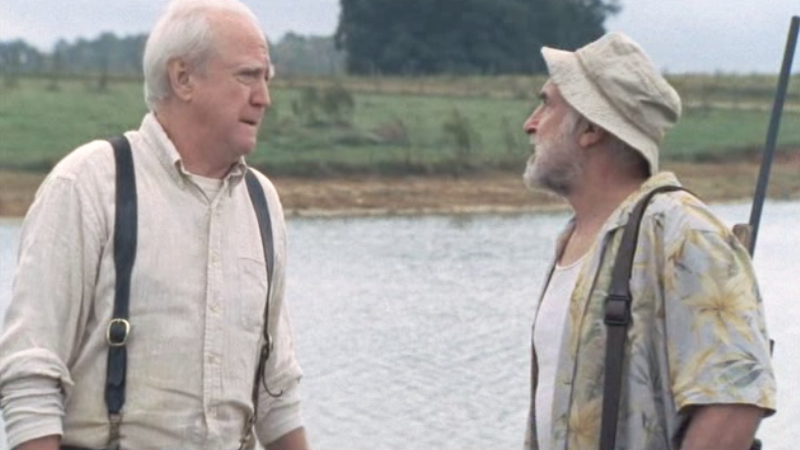 Dale is surprised to discover that Daryl knew of Shane's involvement in Otis' death all along. He was not fooled by the illogical story that Shane told the night of the death. 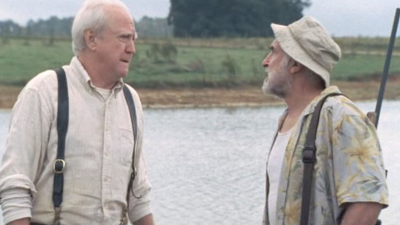 Dale then tries his luck with Hershel and Shane. But all of his arguments fall on deaf ears and he cannot convince anyone that Randall should be spared. While Dale makes the rounds trying to convert the Group, Carl wanders around the Greene's property. 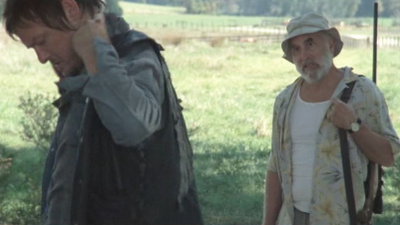 He roots through Daryl's bag and steals his handgun. The boy then finds a Walker stuck in the mud and teases it. 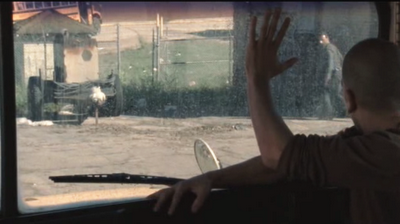 When the Walker breaks free, Carl flees towards the farm. 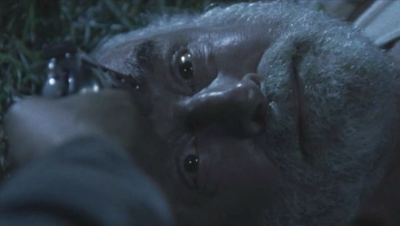 The day ends with Dale unable to win anyone to Randall's side and the decision to execute him is made. 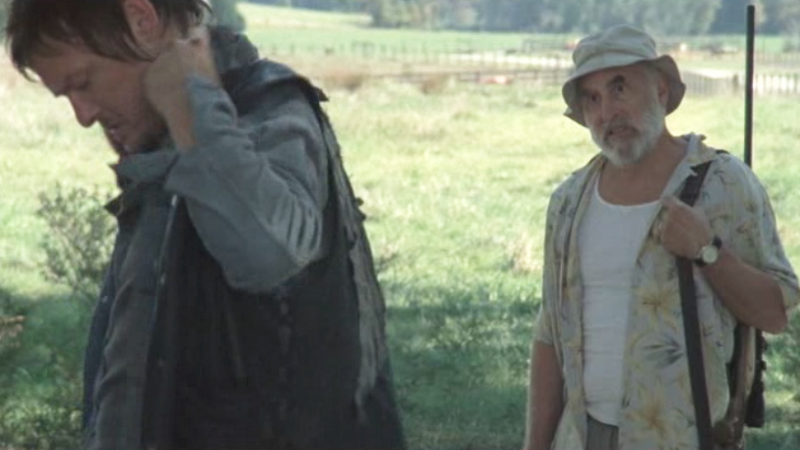 A distraught Dale Horvath walks the perimeter of the property while Rick, Shane and Daryl take Randall to the barn to end his life. Rick is about to shoot Randall when Carl encourages him to pull the trigger. The reality of the situation seems to stun Rick, who once again, spares Randall. 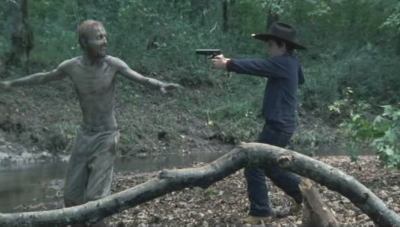 As Dale walks alone, he is attacked by a Walker. Though he fights valiantly, he is gutted in the struggle. 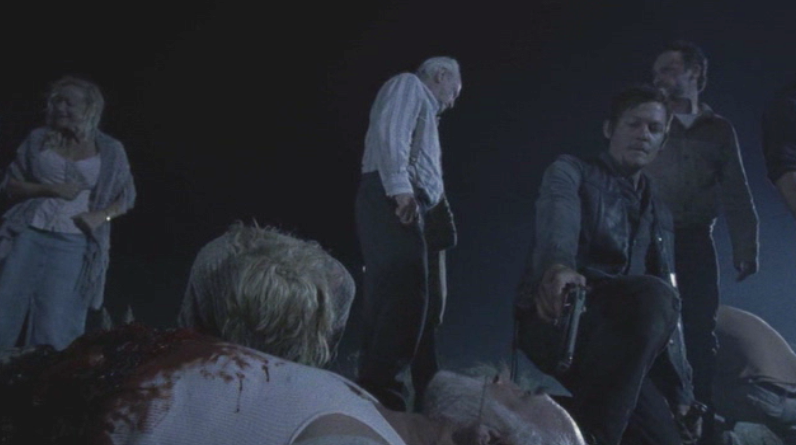 His screams bring the Group running but Hershel sees immediately that even surgery will not save his life. Rick knows what must be done, but freezes when he brings out his pistol. 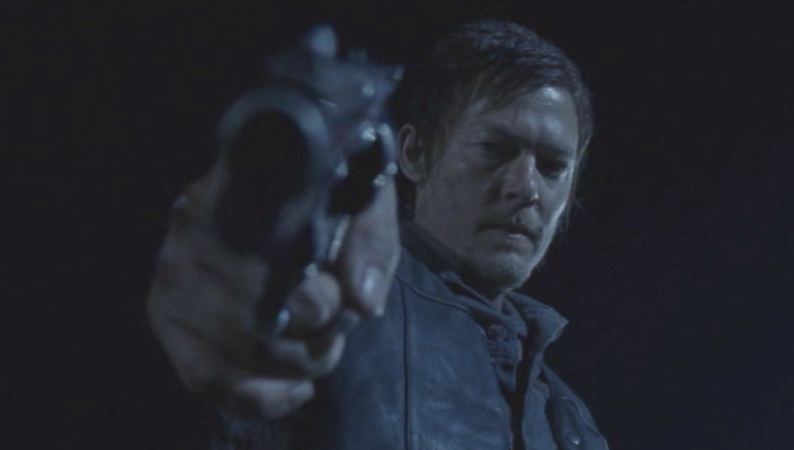 Daryl takes the weapon from the Sheriff Deputy's hand and with a heartfelt apology, ends Dale's suffering. Before the tragic events of the evening, Dale no doubt had prepared supper for the Group. Always creative, Dale likely had some fresh vegetables to work with from Maggie. With the stress of the difficult day, he would have chosen something easy on the stomach. Clam Chowder would be a perfect choice for a cooler evening. Cheddar Biscuits are a savory accompaniment. And when the dead rise: don't let nine-year-olds wander around completely unattended and without adult supervision. In a large Dutch Oven, over medium heat (or medium campfire coals), heat 1-2 Tbsp. cooking oil. Add onion and cook, stirring often, for 3-4 minutes. Add potatoes and cook for an additional 6 minutes or until potatoes begin to soften. Stir in the 2 cans of clams and continue to cook for 3-4 minutes. Stir in the Almond Milk and the package of Leek Soup Mix. Add bay leaves and Thyme. 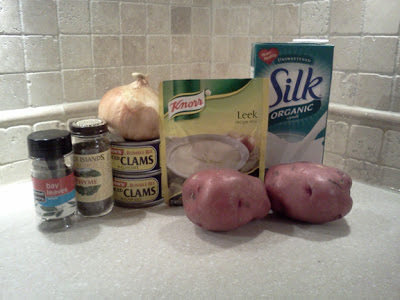 Simmer for 12-15 minutes or until potatoes are soft. Season with Salt and Pepper. Serve with Cheddar Biscuits. Preheat oven to 400 degrees. Alternately, heat campfire coals until red hot. In a large bowl, combine biscuit mix, garlic powder and cheese sprinkles with shortening using a fork or pastry blender (if you can scavenge one). Don't combine them too well; allow some lumps of shortening to remain. Stir in milk and mix only until blended. Don't over mix the dough. Drop by 1/4 cup measure onto a greased baking sheet, or baking pan. Or a greased cast iron skillet if using a campfire to cook. 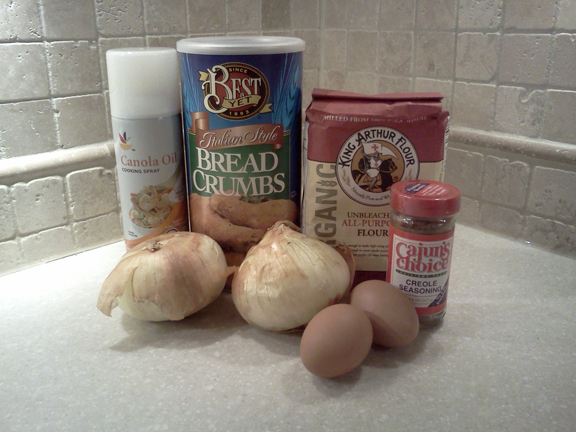 The dough should make 12 biscuits. Bake in 400 degree oven for 15 to 17 minutes or until biscuits are golden brown. Alternately, place skillet over hot coals and cover with lid or aluminum foil. Allow to cook for 12 minutes. Check and rotate skillet if needed. Allow to cook over coals for an additional 5 minutes and remove from fire when biscuits are spongy and appear dry on the tops. In a small bowl, mix olive oil, garlic powder, parsley and sea salt. 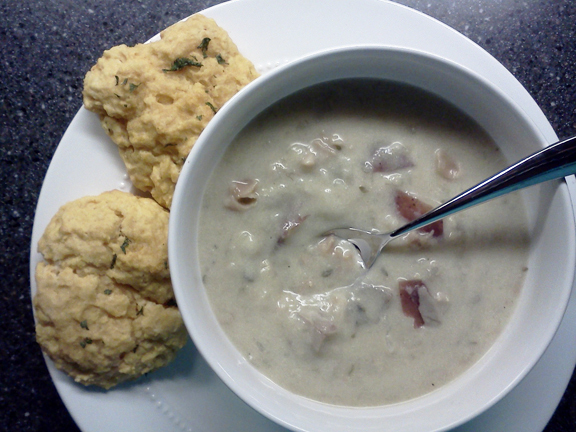 Spoon over warm biscuits as they come out of the oven or campfire. Use all of the mixture. Beth Greene is the youngest daughter of Hershel and Josephine Greene. Although Josie died when Beth was young, Hershel's second wife Annette became like a mother to the girl. When the global apocalypse hit and Annette and Sean were infected, Beth believed her father when he spoke of a cure. It was with the destruction of the captive Walkers in Hershel's barn that Beth's awakening began. She became hysterical upon seeing the reanimated corpse of her mother. And suicidal when she realized that the cure spoken of by her father was an empty promise. The love and support shown to Beth by both her sister and the Group did not convince her that life still had value. It was the reckless move of Andrea that finally forced Beth to make the decision to live. Andrea's allowance of Beth to be alone, permitted the girl to make a half-hearted suicide attempt. And in the process, discovered that she did indeed, want to live. Although terrified at the prospect of death at the hands of a herd of Walkers, Beth doggedly chose to continue living. She was truly a product of her upbringing. A Georgia girl with the values of her Irish family. It is with the spirit of "Misneach" ("courage" in Gaelic) that the WDSCB presents Vidalia Onion Rings in recognition of Beth Greene. Onion rings have been made in the US since 1933. Made with Vidalia Onions, they are elevated to something much more special. Vidalia Onions are one of Georgia's most famous crops. Being both pungent and sweet, they remind us that we must take the bitter with the sweet. Misneach. Preheat oven to 450°. Alternately, get campfire VERY hot and allow coals to become red-hot. Using a large, sharp knife, cut the ends off of both onions,. Slice carefully into 1/4 to 1/2 inch slices. Separate the slices into rings and place all rings into a large bowl of water. Crack both eggs into a separate medium bowl and beat well with a fork. Into a second bowl, add the flour. Into a third bowl, add the bread crumbs and approximately 1 tsp of Creole Seasoning. Remove the onion rings from the water one at a time. Shake off excess water. Dip into flour. Then dip into egg mixture. Then dip into breadcrumb mixture. You must complete the process in this order. Place the onion rings on a baking pan or cookie sheet that has been either greased or sprayed with nonstick cooking spray. Repeat with the remaining onion rings. Make sure you space them well apart on the baking pan and don't crowd them. Then spray all coated onion rings with cooking spray. This step is not critical but it does result in better flavor and allows the crumbs to adhere better. If you cannot scavenge cooking spray, it is fine to skip this step. But do make the effort. Bake in a preheated oven for 7-8 minutes. Remove from oven and turn over all onion rings. Spray with cooking spray again and bake for 7-8 more minutes. 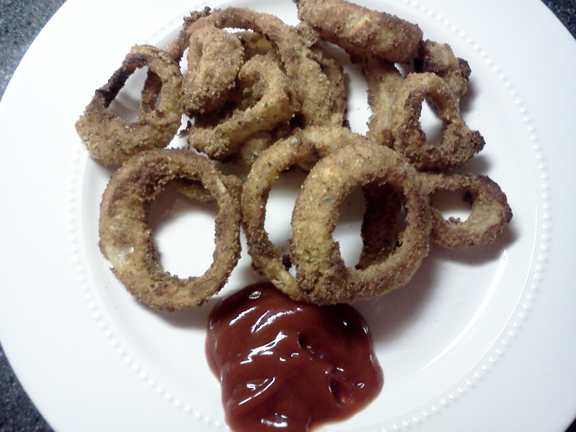 Alternately, place onion rings onto a cast iron skillet. Spray as directed above. Cover with lid or aluminum foil and cook over campfire for 5-6 minutes. Flip and respray as directed above. Cover again and cook for an additional 5 minutes. Remove from oven and serve with Ketchup if you can scavenge any. Disturbing reports continue to surface of the existence of a walled community in Coweta County, Georgia. The WDSCB has heard from several survivors who assert that a self-proclaimed "Governor" has seized power there. This "Governor" has cobbled together a ramshackle army and has the potential to seize control of the entire southeastern region of the state. We would urge all survivors in the area not to venture near this part of the county until these reports can be independently verified. Our best wishes for continued safety go out to: Brian, Kim, Sammy, CrossbowKT, Larry, and Sarah. We sincerely thank them for their updates, even in the face of constant danger. As cooler weather approaches the United States, all survivors should be making efforts to prepare as outlined in the FEMA manual for Emergency Preparedness. 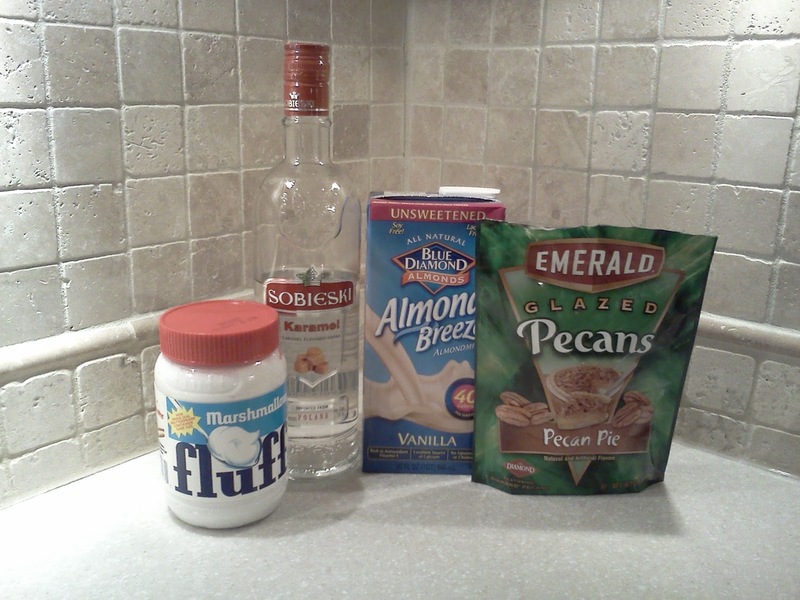 In addition to fuel and warmer clothing, alcoholic beverages can be useful. Heavy in caloric content, they can also create a warming sensation, although Survivors should not repeatedly rely on alcohol as a solution to exposure. 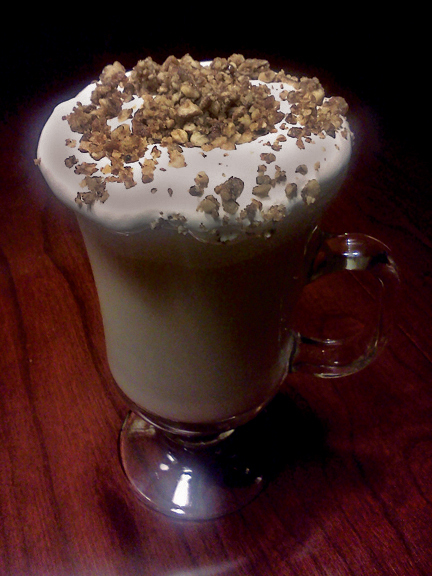 The "Icepick" is traditionally served in summertime and contains iced tea, lemon and vodka. While refreshing, it would not be suitable for cooler climates. So the WDSCB presents the "Senoia Icepick" in honor of the brave survivors of Georgia who are facing this new threat without the aid of Federal troops. Rich and flavorful (with hints of caramel and pecan), this unique hot toddy will be perfect to serve before your Group members have to take their turn keeping watch. We would like to also dedicate this unique beverage to Krystal. Her words of wisdom regarding roadtrips with strangers will serve to remind us to always be vigilant in this harsh new world. In a small pan over medium heat (or medium campfire coals) mix the milk and vodka. Stir gently until hot. Pour into mugs (ones with handles). Top with a large tablespoon of Marshmallow fluff. After Rick, Glenn and Hershel return to the farm with Randall, the young man's leg is saved with surgery. Almost immediately, the Group disagrees on what to do with him. 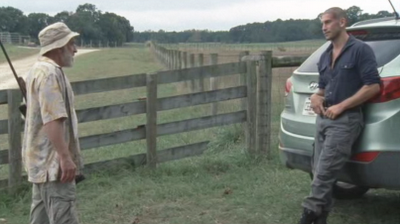 Rick ultimately chooses to drive Randall 18 miles away from the farm and drop him off. Shane goes with him but before they reach their destination, Rick pulls over and confronts Shane about his affair with Lori. 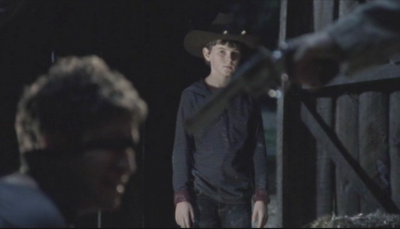 He warns Shane that Lori, Carl and the baby are HIS family. 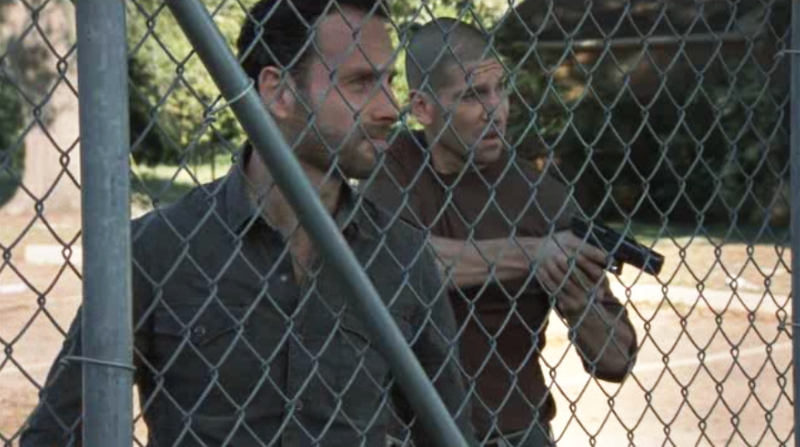 Rick assures Shane that he does not love Lori. And is simply confused with the stress of their changed new world. They arrive at the Department of Public Works and as they prepare to leave Randall, the boy begins screaming for them to come back. He assures them that he would do nothing to harm the Greene family as he had gone to school with Maggie. Shane returns to his original opinion that they should execute Randall. Rick wants to take Randall back to the farm for more discussions. 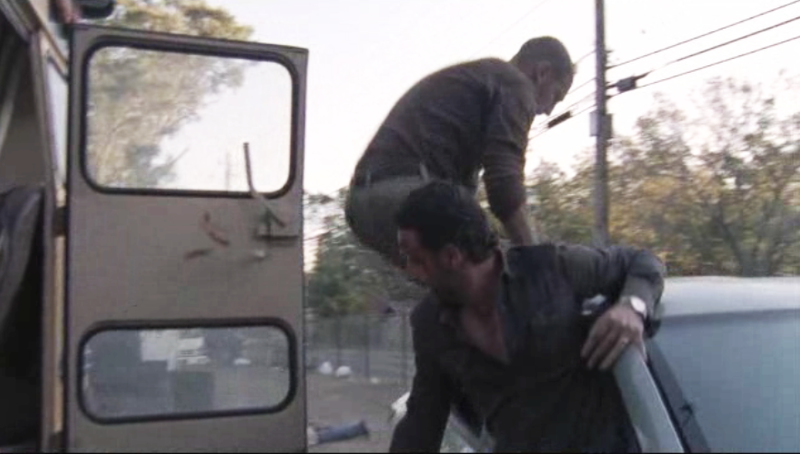 When Shane hears Rick's plan, he attacks his former partner. The two men battle and in the chaos, a group of Walkers are alerted to their presence. 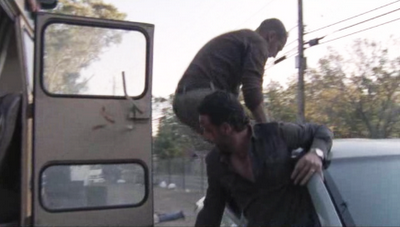 Rick barely manages to escape with Randall, while Shane seeks refuge in a school bus. Rick and Randall quickly return and rescue Shane and the three head back to the Greene farm. Beth has become despondent over the loss of her mother. She hints that she'd rather die than live to see the farm overrun. Maggie responds by watching Beth and refusing to leave her alone for even a moment. Andrea believes that because she too faced this moment (and had her choice taken from her by Dale), Beth should be allowed to choose freely. Promising Maggie that she will sit with Beth, Andrea promptly leaves the girl alone. Bet makes good on her desire to take her own life but only succeeds in making shallow cuts in her wrists. Hershel stitches the cuts carefully when he returns. An enraged Maggie threatens Andrea and warns her never to step foot in their house again. More awkwardness no doubt followed when the Group finally sat down to their evening meal. 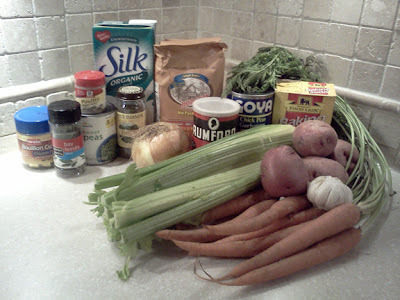 With fresh meat being rationed for Hershel's family, the Group likely made a vegetable based version of chicken and dumplings. Collard greens with onions would be a thoroughly Southern accompaniment. And when the dead rise; don't throw wrenches. In a large Dutch oven over medium heat (or medium coals), heat a tablespoon of oil. Add onions, garlic, celery, carrots and potatoes. Heat gently stirring often, until onions are transparent and soft. Add the broth (reserving 1/2 cup) and milk along with the spices and salt. Add the beans or chickpeas if you are using them. Bring to a simmer and cover. Simmer slowly for 20 minutes or until potatoes are soft. In a separate, small bowl, stir the 3 Tbsp flour together with the reserved 1/2 cup of broth. Stir until there are no lumps. Whisk into simmering stew mixture and stir well. This will thicken the stew. Simmer gently while you prepare the dumplings. Add all dumpling ingredients together in a medium bowl. Stir just until blended (don't overbeat mixture). Using a tablespoon, drop dumpling batter by spoonfuls into the simmering stew. Make sure that the entire surface of the stew is covered. Cover the Dutch oven with its lid. Allow to cook for about 15-20 minutes. The dumplings should be just a little shiny and puffed when they are done. 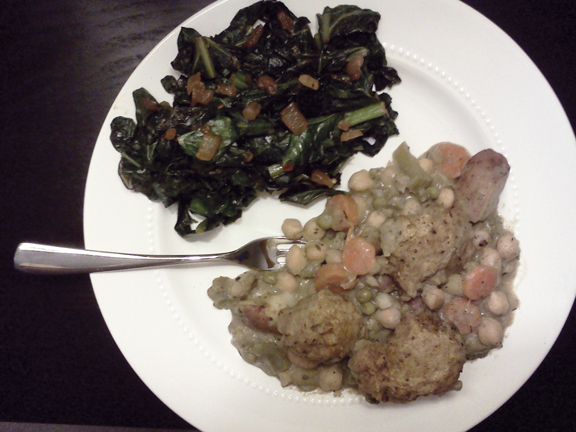 Serve with Collard Greens. In a saute or frying pan, heat the oil over medium heat. Add the diced onions and saute until transparent, about 6 minutes. Add the Bacon Salt and stir. 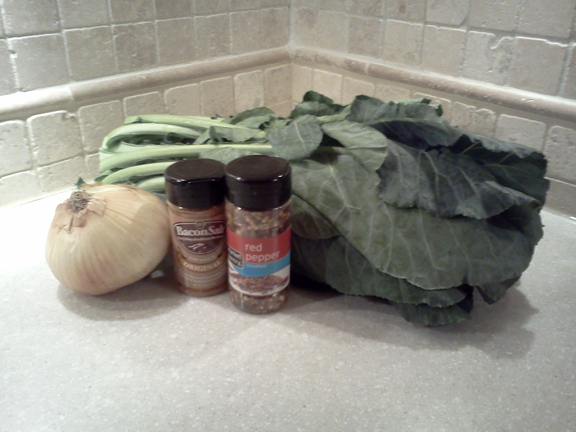 Add Collard Greens. Season with salt and pepper. Cook gently, tossing often to blend well with onion mixture. Cook until tender; about 12 minutes. Stir in crushed red pepper if desired and serve hot. As the eldest daughter of Hershel and Josephine, Maggie Greene grew up on a farm surrounded by the love of her family. When she was a teenager, Maggie lost her mother. She was fourteen when Hershel remarried. She gained a new family with step-mother; Annette and two half-siblings; Sean and Beth. After the Global Apocalypse, Annette and Sean were infected and lost their lives. Maggie and her surviving family did the best they could to stay alive and keep the farm running. The arrival of the Atlanta Survivor Group changed everything. Maggie fell in love with Glenn and became the sole advocate of the new Group. 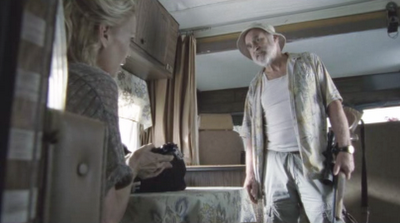 She championed their cause and it was her influence that changed Hershel's opinion of the newcomers. Hershel finally came to accept the truth about the Walkers and Maggie and the Greene family soon joined forces with the Group. As new dangers arose, she took comfort in the presence of her new friends; especially Glenn. Although Maggie was sheltered as a child, she proved that she was capable and that city-slickers hold no advantage over country girls. 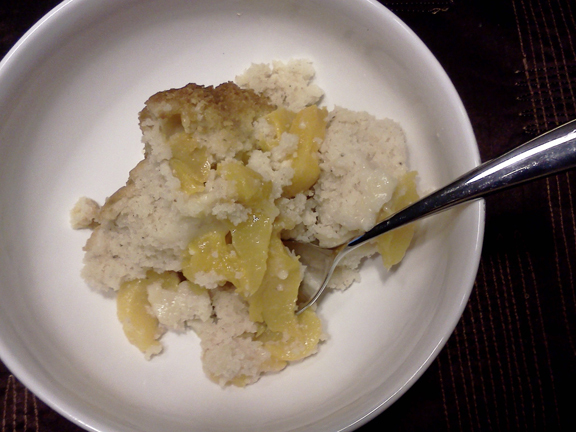 In recognition of Maggie Greene; the WDSCB presents Peach Cobbler. Peaches have been grown in Georgia since 1571 when they were introduced by Franciscan monks along Georgia's coast. The crop flourished in the warm Georgia climate and by 1858, growers in Georgia were shipping their famous fruit as far away as New York city. Cobblers are a perfect way to showcase this delicious crop. A light batter tops this famous fruit so that the natural flavors can shine through. Like Maggie; the Peach Cobbler starts with a Georgia original and kicks it up a notch. Preheat oven to 375° or heat coals to glowing embers. Grease an medium-sized Dutch oven with shortening. 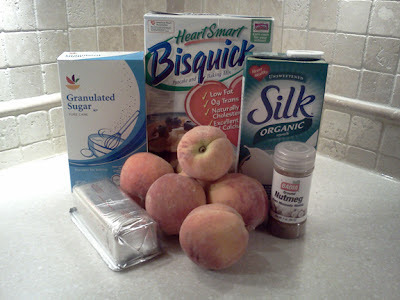 In a medium bowl, toss peeled, sliced peaches with 1 Tbsp of sugar. Pour into prepared Dutch oven. 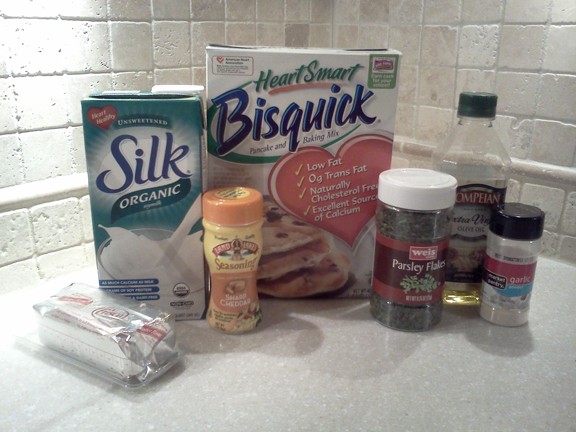 In the same bowl (less dishes to wash will conserve water), mix Bisquick, nutmeg, soy milk, sugar and shortening. Blend well. Pour over peaches and smooth batter with a spoon to ensure peaches are covered. Bake in preheated oven for 28-35 minutes. Insert a knife or cake tester into the top of cobbler. If it comes out clean (with no crumbs or moist batter clinging to it), you may remove it from the oven and serve immediately. It may require more cooking time, if the peaches are very juicy. Alternately, for campfire cooking, cover Dutch oven with lid or wrap tightly with aluminum foil. Place over a cooking grill over campfire embers. Allow to "bake" for 20 minutes. Turn 180 degrees on grill. And allow to "bake" for an additional 20 minutes. Check under lid. Peaches should be soft and juices will be thickened. And the topping should spring back when touched lightly. More cooking time may be required. Check frequently.